· Trim turnips by cutting greens just above turnip and removing “tail” from root end. Rinse but do not peel. Cut larger turnips in half, if desired. · Place in a large skillet. Add enough water to cover about half way. Add butter, sugar and a pinch of salt. Bring to a boil. 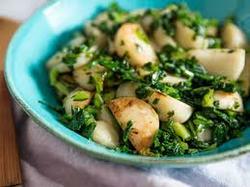 Cook uncovered, stirring occasionally, until liquid is syrupy and turnips are tender, 10 – 15 minutes. · Add greens to skillet cook over medium heat, stirring, until just wilted, 2 – 3 minutes. Season with salt and pepper.